An eyewitness who says he was shooed away from the scene. A slow-moving trial. A prosecution building its case on paperwork and police reports. Those were among the key takeaways from the first week of trial in the conspiracy case against three current and former Chicago police officers accused of working to cover up the 2014 shooting of Laquan McDonald. 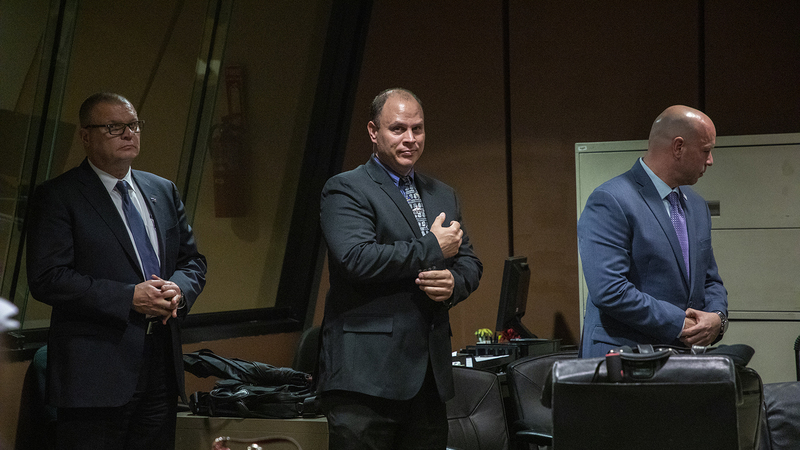 Chicago Officer Thomas Gaffney, former officer Joseph Walsh and ex-Detective David March each face charges of conspiracy, official misconduct and obstruction of justice after they allegedly falsified reports from the scene of the shooting to “conceal the true facts” of McDonald’s death in an attempt to shield fellow Officer Jason Van Dyke from prosecution. On Oct. 5, Van Dyke was found guilty of second-degree murder and 16 counts of aggravated battery with a firearm. With the unprecedented trial on hiatus until next week, here are five highlights from the first three days of testimony. “I started cursing. I said ‘what the f---,’” Chicago police Officer Dora Fontaine testified Wednesday. Fontaine accused March, the lead investigator into the McDonald shooting, of fabricating a statement attributed to her in his official report. She arrived on the scene just before Van Dyke began shooting the teen and testified Wednesday that she never saw McDonald use a knife or make any “attacking” motions toward police. Despite that, March’s report states Fontaine told him she had seen McDonald raise the knife in such a manner. “I was upset because I had not said that,” she testified. Fontaine was a key witness for the state – an officer who was on the scene the night of the shooting now offering the most concrete accusation of a cover-up outside of paperwork and email. Defense attorneys attacked Fontaine’s credibility, accusing her of shoddy police work and lying in order to save a job “she needs” after several other officers involved in the shooting were stripped of their badges or recommended to be fired. Jose Torres and his son, Xavier, were two of the only people who watched the shooting with their own eyes. But only seconds later, the elder Torres said he was waived away from the scene by an unknown officer. Prosecutors have argued police conducted an incomplete investigation of the McDonald shooting and ignored or shooed away witnesses on the scene. Immediately after the shooting, Torres, who testified Thursday, claimed an officer shined a flashlight in his face and made a “gesture” toward him to get him to leave. He eventually contacted the Independent Police Review Authority days later after hearing a police union spokesman on the news incorrectly claim McDonald had “lunged” at police before being shot. Defense attorneys have denied the claim that any eyewitnesses were purposefully sent away from the scene. Other officers who testified said they didn’t see any pedestrian eyewitnesses on the scene that night. Torres also testified he never gave his name or contact information to officers on the scene and didn’t call the Chicago Police Department or the Cook County State’s Attorney’s Office in the ensuing days. Charges in this case stem from alleged actions following the shooting of McDonald, but defense attorneys have continuously highlighted the 17-year-old’s actions before he was killed, claiming the defendants acted properly and McDonald alone was responsible for his death. McDonald attacked a truck driver and stabbed at a police squad cruiser in the moments before his death. The defense argued these were forcible felonies committed by an armed assailant, which justified Van Dyke’s use of deadly force. That narrative, pushed most firmly by March’s attorney James McKay, could help to convince the judge that no conspiracy existed because officers believed it was a clean shooting. If March believed the incident was justified, he would have no reason to try and cover for Van Dyke. Van Dyke’s attorneys tried a similar approach at his trial, but jurors came away unconvinced that anything McDonald did leading up to the shooting had a bearing on his death. In a bench trial, however, the judge may see things differently. What reports are police officers required to fill out, and when are they supposed to file them? That was the crux of testimony Wednesday from CPD Sgt. Larry Snelling, a 26-year department vet, who spoke at length about how and when officers are supposed to fill out two types of reports – tactical response reports (TRR) and officer battery reports (OBR). TRRs are used when an officer uses force, while OBRs document assaults or batteries against an officer. Prosecutors argue that, as part of their conspiracy, Walsh and Gaffney filled out TRRs to make it appear as though they and Van Dyke were the victims of an aggravated assault or battery at the hands of McDonald. Those reports would make it look as though McDonald had attacked and injured police, forcing Van Dyke to fire his weapon. Dashcam video of the incident shows that was not the case. Snelling reviewed that footage and testified Van Dyke was the only officer who should have filed a TRR because he was the only one who actually used force. But the defense claimed the men only filed TRRs due to a quirk in the police department’s computer system. Any officer who wants to fill out an OBR must first fill out a TRR, even if they didn’t use any force, Snelling said. Walsh and Gaffney claimed they were both victims of either a battery or an assault – which does not require any physical contact – at the hands of McDonald, thus they had to fill out both reports. Before the trial began, Special Prosecutor Patricia Brown Holmes estimated it would take just two to three days to present her case. But after getting through just two witnesses per day the prosecution was unable to rest before the end of the week. Testimony has regularly dragged on for hours between state questioning and cross-examination from each of the three defense attorneys in the case. Joseph Perfetti, a CPD record keeper, spent three hours on the stand Tuesday reading through police reports from the McDonald shooting. Chicago police Officer Dora Fontaine’s testimony lasted just as long, with extensive cross-examination by defense attorney James McKay. The trial starts each day around 11 a.m. after Judge Stephenson wraps up her morning call and has run late into the evening with no breaks save for a one-hour lunch intermission. It was previously thought the trial could last less than a week. But scheduling conflicts will prevent the trial from resuming until next Tuesday afternoon and the defense is yet to call its first witness.